Kobe Steel in collaboration with Midrex Technologies, Inc., a subsidiary of Kobe Steel in the USA, has developed the FASTMET process which is a coal based direct reduction process of iron making. The FASTMET process converts iron ore pellet feed, iron ore fines and/or metallurgical waste from the steel plant into direct reduced iron (DRI) using pulverized non coking coal as a reductant. 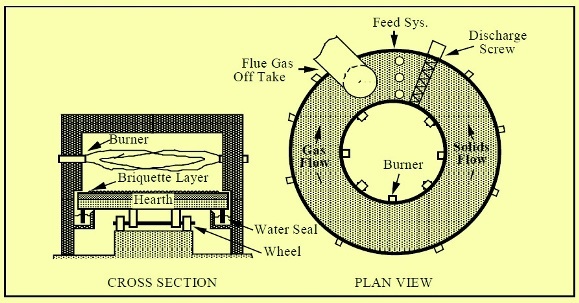 The process uses a rotary hearth furnace (RHF) for the reduction reaction (Fig 1). The end product DRI can be hot briquetted (HBI), discharged as hot DRI into transfer containers, or cooled if cold DRI is needed. FASTMELT process is the FASTMET process with addition of an Electric Iron Melting Furnace (EIF) to produce liquid iron or hot metal. Hot DRI is directly discharged from the RHF into EIF and is melted to produce hot metal. The first commercial FASTMET plant was commissioned in April 2000 at Nippon Steel’s Hirohata works. A total of 5 plants have since been commissioned. The details of these plants are given in Table 1. It can be seen that this process is being presently used for utilization of the metallurgical waste of the steel plant. Besides metallurgical waste the process can also use iron ore fines having size which is equal to pellet feed size (<45 microns). This is because the process has got inbuilt agglomeration steps. FASTMET/FASTMELT process presents an alternative route to iron making in capacities ranging from 100,000 tons per annum to 500,000 tons per annum. FASTMELT process offer an alternative for mini blast furnace technology. The refractory used in RHF and EIF are of standard specification normally used in iron making. The design of EIF is based on proven designs of EAF (electric arc furnace) and LF (ladle furnace) technologies. The FASTMET process start with pelletizing/briquetting of fine iron ore or pellet feed ore and ground reductant (non coking coal) and its drying before they are sent to RHF. The materials are placed on the RHF in a single layer. The process flow is shown in Fig 2. The reduction reaction kinematics in a direct reduction furnace is normally controlled by the reduction gas diffusion from the outside. 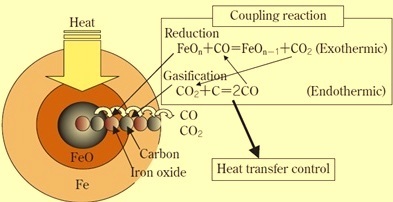 In the FASTMET process, the reduction reaction occurs inside the carbon composite pellets/briquettes made up of iron ore fines and the pulverized coal (Fig 3). Once the composite pellets/briquettes are heated, carbon mono oxide inside them, promote the reduction of iron oxide. Thus the reduction reaction proceeds faster in the carbon composite pellets/briquettes than the reduction reaction happening in the conventional direct reduction process. The following basic reduction reactions are considered to be occurring during the FASTMET process. At temperatures below the melting point of iron, there is hardly any direct reaction with the solid carbon of pulverized coal and hence the reaction as given in equation 1 dominates the reaction kinematics. 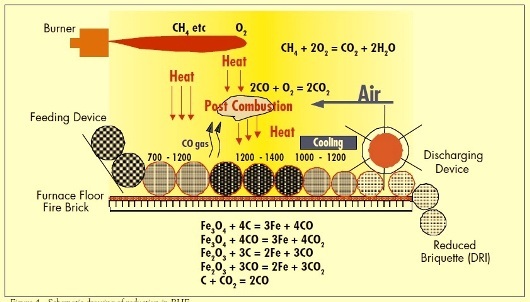 At elevated temperatures of 1000 deg C and more, the reaction of the generation of carbon mono oxide by carbon solution loss as per equation 2 and the reaction of iron oxide by CO as per equation 3 take place in series inside the carbon composites pellets/briquettes. In the above reactions CO gas generation controls the reaction kinematics with its highly endothermic nature. Hence to promote the reaction, it is essential to supply the heat required for the reaction to the inside of carbon composite pellet/briquette at an elevated temperature of 1000 deg higher. This means heat must be transferred efficiently by radiation from the atmosphere to the surface of the pellet/briquette, and by conduction from the pellet/briquette to its interior. In RHF, the pellets/ briquettes are normally heated with zone temperatures of more than 1300 deg C and are reduced to metallic iron. Residence time on the hearth is typically 6 to 10 minutes. This varies depending on the material being processed, size of pellets/briquettes, and other factors. The rapid reduction rate achieved in the FASTMET process is due to the high reduction temperature, the high heat transfer rate, and the intimate contact of the carbon contained inside the briquettes with the iron oxide. The heat transfer and the different reduction reactions which are taking place in RHF are schematically shown in Fig 4. 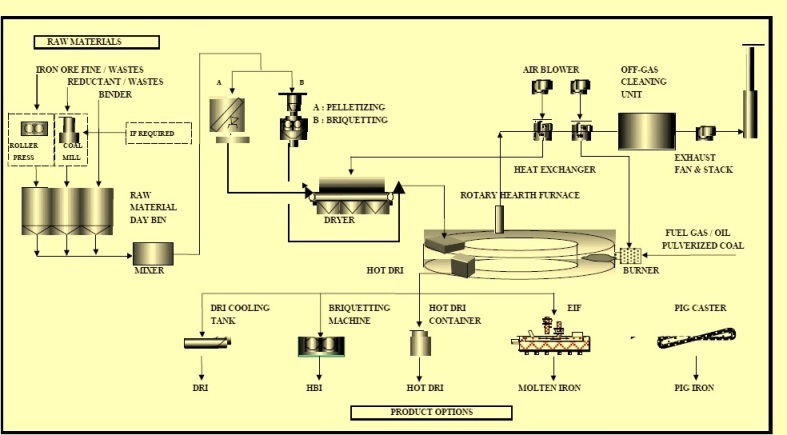 The atmosphere in EIF of FASTMELT process consists essentially of carbon mono oxide and hence highly reducing. This reducing atmosphere promotes silicon reduction and sulphur removal. The flue gas leaving the RHF is fully combusted, containing around 2 % oxygen. Heat exchangers use the thermal energy in the flue gas to preheat combustion air for the RHF burners and raw material preparation dryers. Spray water is added to the primary cooler to cool the gas from more than 1400 deg C to 1000 deg C to minimize NOx formation and to provide an acceptable inlet temperature for the recuperator. From the primary cooler flue gas flows through the combustion air and dryer air preheater where the heat from the flue gas is used to heat combustion air for the rotary hearth burners and the rotary dryer. The flue gas exits the combustion preheater to the secondary cooler. Spray water is added to the secondary cooler to cool the gas from approximately 800 deg C to 120 deg C to provide an acceptable inlet temperature for the bag filter system. The flue gas then flows to a jet fabric filter bag house where the dust is collected and then to an ID fan where it is discharged through a stack to the atmosphere. SO2 control is generally not needed in FASTMET process since most of the SO2 reacts with and is absorbed by the metallic oxides in the gas flue stream. NOx is controlled by the use of low NOx burners and close operational control of air to fuel ratio and combustion temperatures. Dioxins and Furans are destroyed by the high temperatures and long residence time within the RHF. Flue gas cooling rate is controlled to minimize Dioxin and Furan reformation. FASTMET process is an environmental friendly process. CO2 emission from FASTMELT process is around 1.6 tons per ton of hot metal against around 2.1 tons per ton of hot metal of CO2 emission in case of mini blast furnace. The emission of NOx is in the range of 0.3 – 1.5 kg/tHM and that of SOx emission is around 2.4 kg/tHM.